Ok, all you left-handed stitchers out there! Here’s the book you’ve been waiting for – and guess what? If you’re a right-handed stitcher, you’ll be interested in this review, too! When Yvette Stanton set out to create a left-handed stitch dictionary this past year, I never expected anything less than another excellent book by Yvette. But now that I’ve seen the book, my opinion has changed a little bit. You see, Yvette has written some exceptional embroidery books, so I figured this stitch dictionary would be in the same category. But you know what? She’s outdone herself on this. I’m not exaggerating! I think this is her best book yet. 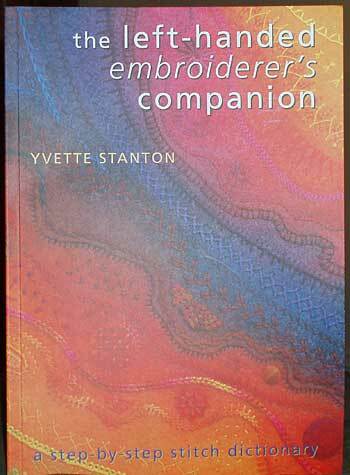 Yvette’s other embroidery books are very topic-specific. Besides this new books, she has written a Mountmellick book, a Ukranian drawn thread book, and a Hardanger embroidery book. All of them are thorough and excellent instructional books in their specific categories. But the Left-Handed Embroiderer’s Companion is in a different category, and this is why I think it catapults to the top of the list. It is a book for everyone! Ok, you’re right. She wrote the book for left-handed stitchers. But, see, there are stitch dictionaries, and then there are Stitch Dictionaries. I have some absolutely favorite stitch dictionaries. 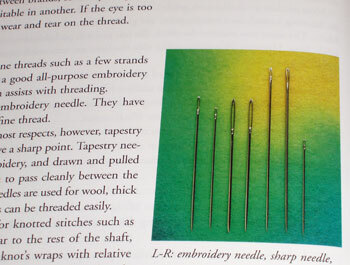 And being a right-handed stitcher, I can pretty much use any stitch dictionary I want to use. Some are better than others, so I stick with a few favorites. But Yvette’s stitch dictionary, while written for left-handed stitchers, is so thorough. So totally instructional. So clear. So…. Everything you want a stitch dictionary to be! She begins with some basics, like the question of starting and ending threads. She discussed needles and the importance of the right needle, explaining differences in needles and so forth. And then she launches in to the Dictionary Proper. And this is where it gets amazing. Her diagrams feature step-by-step movements of each stitch she covers. 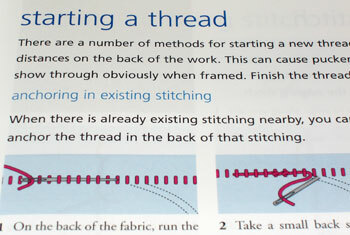 Under each diagram, she meticulously and clearly explains the step of the stitch. On each stitch page, she includes colorful photo examples of the stitch worked on fabric or felt (some gorgeous felt photos in here!) in various threads. The background of each stitch diagram, as you can see in the photo above, is blue. But what is that pink square? 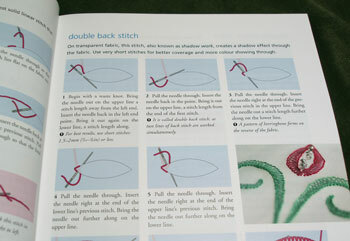 Oh – yes, she includes in the right handed movement for the stitch as well! In one square, she clarifies the difference between the stitch performed by a right-handed stitcher and the stitch performed by a left-handed stitcher. 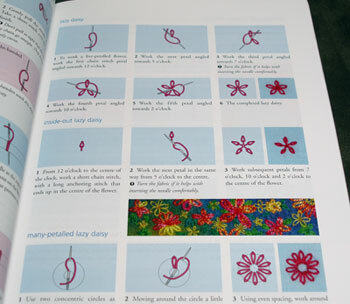 I’m a huge fan of Country Bumpkin’s step-by-step photos of stitches found in their A-Z books, in Inspirations Magazine, and in their various other books (like The Embroiderer’s Handbook). Since I’ve become so attached to the Country Bumpkin way of presenting step-by-step photos in their books, I was pretty certain drawn diagrams would never quite hold the same appeal. Yvette’s diagrams are computer graphics that mimic photos – the movement of the needle and thread, the position of the fingers and so forth, are all included. So although you might be tempted to think that, since she’s using diagrams rather than photos, this dictionary doesn’t measure up, don’t worry! It does. The diagrams are perfectly clear when it comes to the movements used to create a stitch. Many embroidery stitches have variations – and many embroidery stitches have many variations. Yvette covers variations on stitches that have them, so that you can experiment all kinds of ways of using the stitch. And she includes in the dictionary many obscure stitches that you don’t always find in stitch dictionaries. She goes beyond the basics with specialty stitches like the Mountmellick Thorn Stitch and the elusive Plaited Braid Stitch (for which she presents thorough instruction, including the questions of spacing and width). 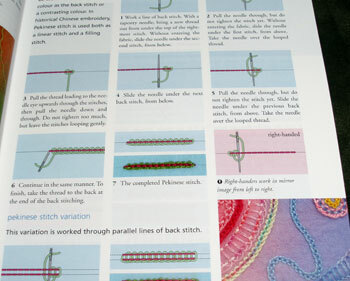 The book features 74 stitches plus variations. It is an amazing stitch dictionary that I know left-handers especially will appreciate because they’ve waited a long time for a book written for them with this kind of quality content. 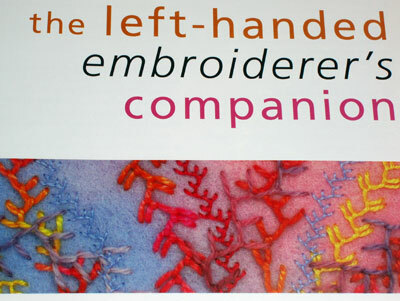 Worldwide with free shipping, Left-Handed Embroiderer’s Companion is available through The Book Depository in the UK. Thanks Mary, for yet another great review. I can buy books sight unseen just based on your reviews and they have all been great investments. I have a girl who is left handed in my class… so maybe I should ask her to look for this book. looks like a great reference book! I'm a lefty but self taught to do just about everything. It will be interesting to see just what I'm doing left or right. Now I just have to get the order in. thank you so much for your inspiration! Yvette's books are totally awesome! 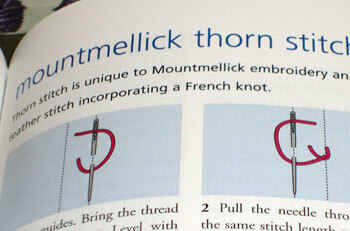 I just Love Love Love her Mountmellick book. I was so happy to hear that she was doing a left handed book. I am right handed but was taught embroidery by my Mom who was left handed, so I get a little lost sometimes in the right handed world. I just learned differently than everyone else. So glad you reviewed it. I really want to move to Australia, They are so supportive of the craft of embroidery. Dear Mary, It was with interest that I read your review on the embroidery book for left handed persons. Suddenly I felt so stupid when I came to the part: right needles. For a second I thought, wow left needles, what will they think up next? Then it dawned on me right, as in correct. Well I hope it also make you smile. Lastly I hope that you and your family will have a blessed Christmas and a wonderful New Year. Regards Elza Bester, Cape Town. Hi, Mary. I love to sit and read some of your older blog posts when I have the time, I only discovered your blog site a couple of weeks ago, and just came across your 3rd anniversary blog entry. Thank you for your enthusiasm for all that you do, and your desire to share what you learn and know with those of us who are learning from you. You are a true teacher at heart, and I look forward to your blog every day. In fact, it is the first thing I look at when I go online when I get up in the morning. I love checking out the links, and have learned there is so much more to the art and craft of embroidery than I ever could have dreamed. Hello, Yvette here, and I'm BLUSHING! Yes, the book will be distributed in America (and UK/Europe, and of course Australia!) and should be arriving in shops very soon. If your local shop doesn't have it – ASK FOR IT! For shops who are interested in stocking the book, the US distributor is Dinky Dyes, the UK/Europe distributor is Search Press, and the Australian distributors are CraftBook Wholesalers and Ristal Threads. If you're a distributor in another part of the world, and you want to stock it, please contact me! And as Mary says, you can always order directly from my website. I do hope that all you fellow lefties enjoy it as much as I enjoyed writing it. I had a ball! I’m a lefty but self taught to do just about everything . I was so happy to hear that she was doing a left handed book. 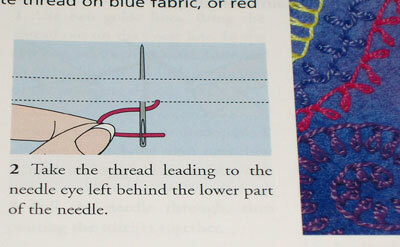 As a left handed stitcher I find it’s indeed sometimes difficult to learn from right hand diagrams. I always had throuble learning needlework . It will be interesting to see just what I’m doing left or right. I don t know how can it buy ? I live in Iran and I do not know how can I preparing this book ? please tell me . I look forward to your emails re the 12 days of Christmas. I feel that even if I am not fortunate enough to win, I am learning so much that is valuable. I am right handed but when stitching I like to research the stitched I am about to make so this book would be invaluable. It sounds so exciting that there is a book of this calibre. I would like to leave a tip, that these books were translated into Portuguese (Brazil), because we only sound in the water in the mouth, no books, it would be wonderful if that happened. If any language Portuguese (Brazil) let me know. I will do everything to gain, I think of you beautiful embroidery. I will be purchasing this book ASAP! Being a left handed person this a book that I am definitely going to get. I can usually understand the books written for right handed people. But, this is a like a diamond in the rough for me. Now, I don’t have to figure it out. Thank you so much for reviewing this book. Many thanks. Thank you so much! I am excited to get a copy.